Geospatial Data Acquisition and Product Development coordinates geospatial data acquisition for government and provides digital mapping, land surveying and geodesy services to government. It is comprised of six distinct programs involved in GIS applications, spatial referencing and geo-spatial analysis. The Manitoba Remote Sensing Centre (MRSC) was established in 1974 and has skilled staff with varied backgrounds in geography, forestry, biology, cartography, and business. The staff are able to combine their varied experiences in applying remote sensing technology to many resource and environmental issues. 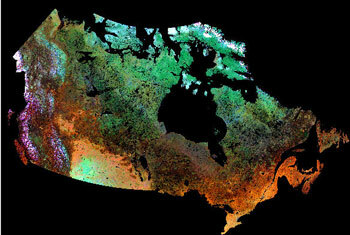 The MRSC is a comprehensive source for solutions to your earth observation needs. Cadastral Mapping is responsible for the development and maintenance of a province- wide digital cadastral parcel infrastructure based on land parcels shown on registered plans of survey. The topologically structured data is used extensively throughout government, by provincial utilities and by general Manitoba GIS community at-large to meet land referencing, planning and decision making needs. The section continues to dedicate its efforts to develop a seamless digital Manitoba land reference grid which includes a fully topologically structured parcel based approximation of the Dominion Land Survey (DLS) system in southern Manitoba. The land parcel fabric for selected portions of the province is available in digital form. Clients can obtain a digital parcel map file in AutoCAD or ESRI data formats for areas of their choosing together with parcel-related attribute files suitable for geographic information system applications or general spatial referencing. All parcel data is downloadable for free from the Manitoba Land Initiative (MLI) spatial data warehouse. The Topographic Mapping Section operates in a computer graphics environment producing a variety of Topographic geo-referenced products. The major goal of the section is completing the 1:10,000 base layer, derived from 1:60,000 aerial photography, and the enhancement of these data sets to assure their compatibility in a Geographic Information System (GIS) environment. Ortho-Photography Program is one of the most popular and heavily used datasets maintained by GeoManitoba and the Manitoba Land Initiative (MLI). The program was established in 1990 to acquire black and white (B&W) imagery for southern Manitoba collected on a 10 kilometre grid at 2.0m resolution. 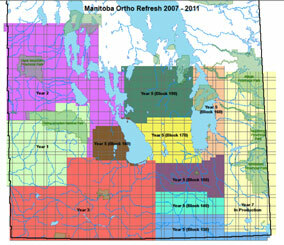 In 2008, an ortho-refresh program was initiated to acquire both B&W and colour imagery at 50 cm resolution for southern Manitoba and will be completed by December 31, 2013. This program establishes and maintains a provincial network of survey monuments, known as the Manitoba Spatial Reference Network, whose geographical positions and/or elevations have been determined, to support the spacial referencing of land-related information. General categories of land-related information include natural resources, environmental, infrastructural, cadastral and socio-economic information. This reference system is fundamental for ensuring the compatibility of all geomatics, navigation and other spatial information from various sources, allowing such information to be exchanged and merged seamlessly and economically. It is an essential part of any geographic or land information system. Typically, spatial reference systems were established with two distinct components -- one for horizontal coordinates: i.e., latitudes and longitudes, and the other for vertical coordinates: i.e., elevations. For the most part, each component was independently established with its own network of survey monuments, due primarily to surveying technology of the day. 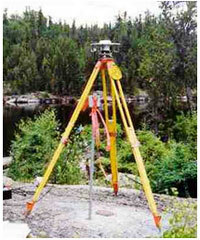 Today, surveying technology allows for effective and accurate 3-dimensional surveying. Manitoba's spatial reference system is an integral part of the Canadian Spatial Reference System (CSRS), which is a hierarchy of federal and provincial spatial reference (control survey) networks. Each layer consists of a network of points for which positions have been determined using a combination of technologies and procedures specific to that layer. Natural Resources Canada establishes and maintains the top three national levels of this hierarchy, and provincial survey agencies look after the bottom two lower levels within their jurisdictions. The result is an integrated federal-provincial coordinate system, which serves as a common spatial reference surface for all mapping, charting, navigation, boundary demarcation, crustal deformation and other geo-referencing needs. 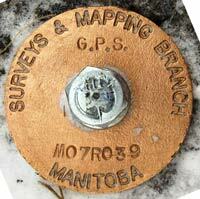 There are approximately 10,000 geodetic or control survey points established in Manitoba. 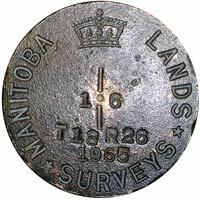 The Land Survey System program restores survey monuments of the provincial land survey system, provides instructions to Manitoba Land Surveyors for the survey of Manitoba Crown lands, examines and approves plans of survey of (MGSP)provincial Crown lands, maintains interprovincial and provincial-territorial boundaries, and operates an information centre on Crown land surveys that includes records of the orignal land surveys. The Director of Surveys has the mandate to administer and enforce The Surveys Act (Part II) and Regulations made there under, to approve plans of survey of provincial Crown lands as required by The Crown Lands Act (Section 9) and The Mineral Disposition and Mineral Lease Regulation (Parts 5 and 6) under The Mines and Mineral Act, to represent Manitoba on matters regarding the delimitation of the boundaries of the Province, to provide survey services to provincial government departments on a cost-recovery basis, to maintain the provincial Land Survey System. The anticipated public policy benefits include a secure process for the conveyance and reservation of provincial Crown lands and rights therein, an economical service for the acquisition and disposition of provincial Crown lands, a basic land survey system to facilitate and expedite the determination of boundaries of property rights, and a homogenous network of survey monuments for the spatial referencing of land-related features and information. Field notes containing original surveys of lands in the Province of Manitoba. Original Dominion Land Surveyor’s Correspondence: Documents containing correspondence from Surveyors/Land owners (grantees) etc. to and from Ottawa, referring to resurveys/boundary disputes/oaths/inspection surveys, etc. Documents are microfilmed and filed by township and ranges. Director of Surveys Plans: Survey plans delineating boundaries of mining claims, administrative boundaries, cottage lot subdivisions, rights of way, etc. submitted to the Director of Surveys for approval and confirmation, as required by The Mines Act and The Surveys Act. Township Diagrams: Plans of the Original Survey Fabric defining the Township Survey System in the Province of Manitoba. Documents are in books and filed by townships. The Survey Services program provides land, engineering, and control surveys and related services to provincial government departments in support of their land-related activities and responsibilities on a full cost-recovery basis. Client agencies require land (legal) surveys for the acquisition and disposition of provincial Crown lands, engineering surveys for the construction and maintenance of public works and control surveys for the spatial referencing of land-related features and information.